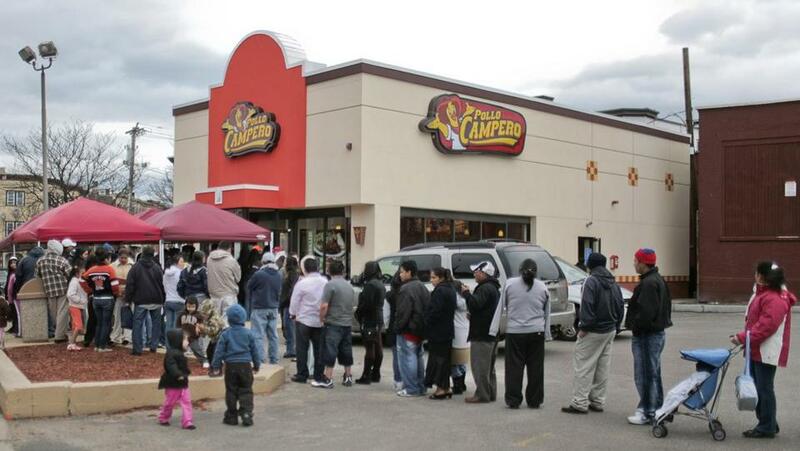 A long line of patrons formed outside Pollo Campero in Chelsea when it opened in 2009. Crews in Chelsea battled a 2-alarm fire on Park Street for three hours early Monday, fighting a blaze that sent one firefighter to the hospital and destroyed a chicken restaurant, Chelsea fire officials said. Firefighters responded shortly after midnight to 115 Park St., where a fire had started in a Pollo Campero restaurant on the edge of downtown Chelsea. The fire began at the back of the building and crews were forced to evacuate it because of difficulty accessing the blaze, officials said. Firefighters were forced to work from outside the building to collapse the fire. One firefighter was sent to the hospital with minor injuries. The building was a total loss, officials said. The Pollo Campero restaurant that stood in that spot was wildly popular when it opened in 2009 and the chain, which opened in Guatemala in 1971, iswell-liked by some Boston area residents from Central America.